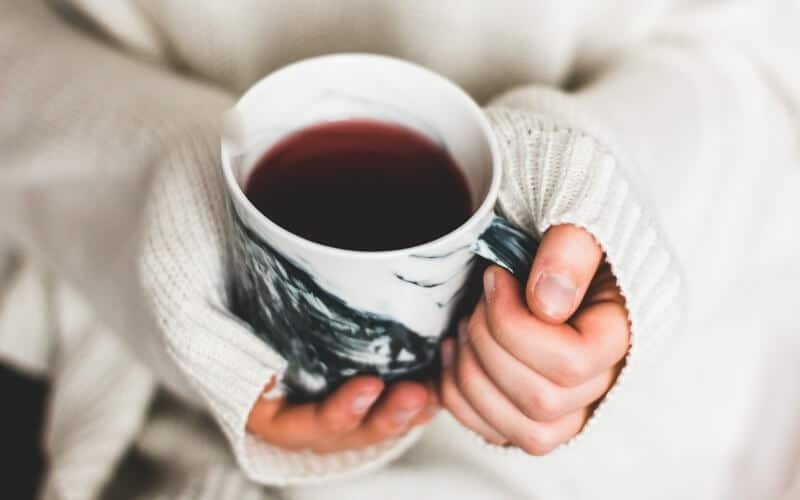 Are you looking for some simple ways to incorporate self care into your daily routine? Or do you wish you had time for self care but don’t know how to start? By now most of us know how important self care is, yet we have trouble getting enough of it. It’s simple. We NEED a self care routine in our busy lives. 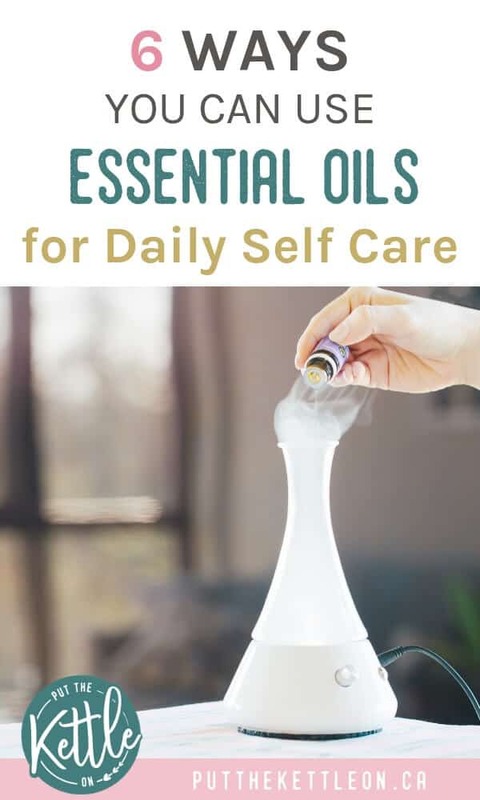 As someone who loves essential oils and self care I wanted to share some ways you can incorporate essential oils into your self care routine on a daily basis. 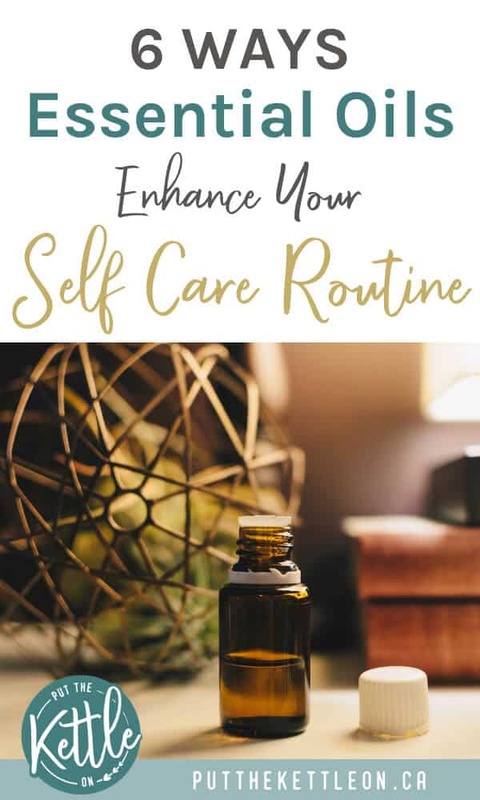 Unlike other self care activities, the simplicity of using essential oils allows us to find new ways to enjoy self care without it taking too much effort. Related: No Time for Self Care? Try These 3 Tips. Experiencing pure essential oils aromatically is one of the best ways to enjoy your oils. Diffusing oils in an essential oil diffuser is a great way to do this. Changes the aroma of your environment. Here are a few diffuser blends you can try that will help you based on your mood. Try this combination to help you relax and get rid of tension. This citrus blend wakes you up and helps you focus. 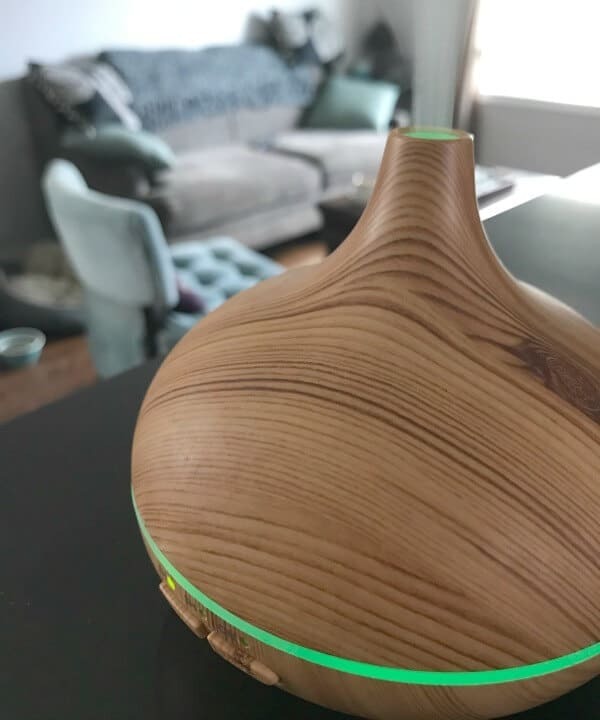 Breathe in while diffusing and you’ll truly feel uplifted. The perfect blend to soothe your mood and create a calming atmosphere around the house. This combination of oils just feels good. Frankincense feels so good when you apply it to your skin in your moisturizer. It has a sweet, honey-like, and woody fragrance. It feels fresh and uplifts the mood. They say it can also reduce the appearance of uneven skin tones, so thumbs up for that! Copaiba is refreshing and cooling to the skin. Put it on your face in the morning with your moisturizer and it will really wake you up! It can also help reduce the appearance of blemishes and gives a glow to your skin. Carrot Seed is a great oil to add to your moisturizer to revitalize and maintain the appearance of healthy- looking skin. I have yet to try it but I’ve heard great things about Carrot Seed oil so it’s on my shopping list for this month. I’ll report back with results. Lavender. I love to add a drop of lavender to my night cream to get me relaxed and ready for bed. It’s extremely calming. Over the Holidays I made some DIY gifts and one of my favourites were these Sugar Scrubs from No Compass Necessary. 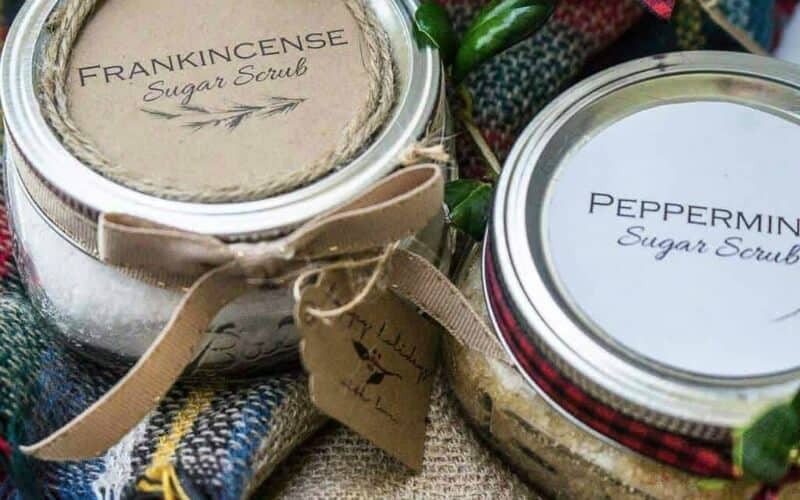 These may be listed as ‘holiday scrubs’ as they are perfect gifts, but here’s an idea – make these as a gift for yourself! They are so easy to make and the ingredients are readily available. 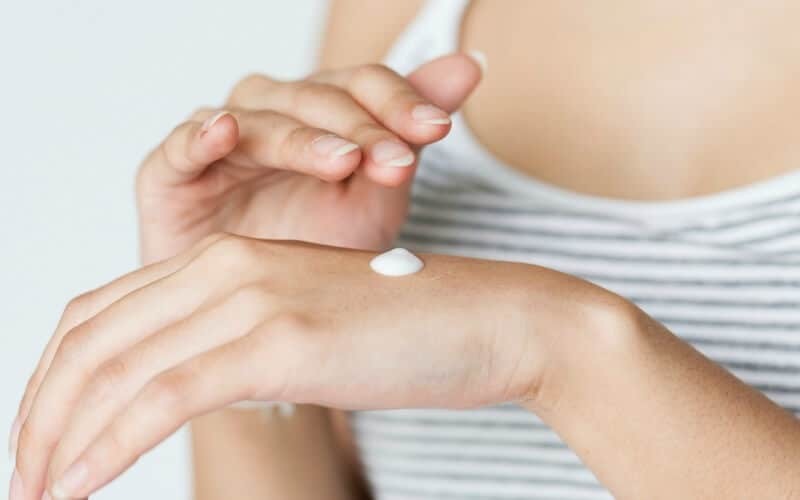 After using the essential oil sugar scrub, your skin will be extremely soft thanks to the addition of the coconut oil and shea butter if you choose to use. If you know anything about me I have an obsession with tea and essential oils get me even more excited to try new tea recipes! Add 1 drop of ginger or lemon essential oils to your choice of tea. I recommend green tea, black tea or ginger tea. This really enhances the flavour. Also, if you have a sore throat 1 drop of ginger in your tea it feels so soothing. You can also check out these other essential oils that can be used internally. Please note: These oils are approved by Health Canada and in the US are labelled for dietary supplement and culinary use. When using essential oils internally you need to make sure you trust where the oils are coming from. I would not recommend picking up a cheap oil from a store and ingesting. If the oil is cheap that means the oil is not pure and not regulated or tested properly. Don’t risk it. We all know that having a nice soak in the tub is a great way to relieve stress and unwind. It’s also a perfect way to incorporate some self care into your routine without it taking up too much effort. Next time you have a bath put about 8 to 10 drops of a calming essential oil in. 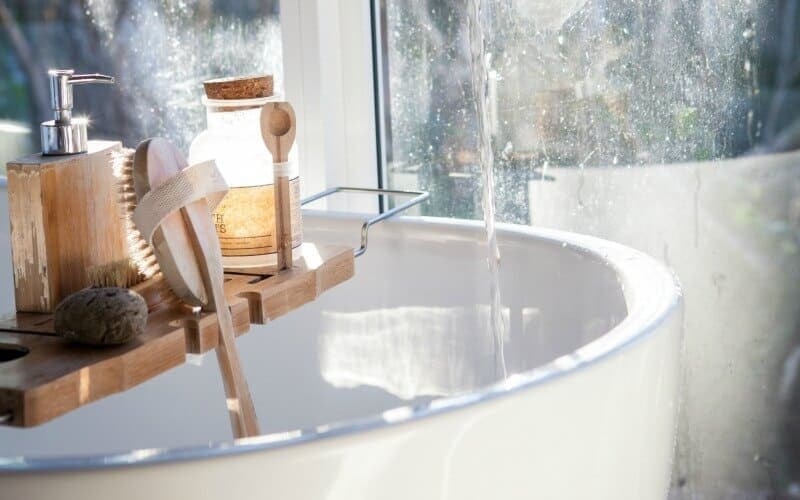 A relaxing essential oil bath lets you enjoy the oils aromatically and your skin will be happy too. Peace and Calming Blend – A Young Living blend made with Ylang Ylang, Orange, Tangerine, Patchouli, and Blue Tansy. Stress Away Blend (one of my favourites!) – A Young Living blend formulated with Lime, Lavender, Cedarwood, and other pure essential oils for a relaxing and calming scent. Ylang Ylang brings on the calm and also helps moisturize the skin so it’s perfect for the bath. Peppermint can not only bring on calming feelings but it can also help with nervous tension. It’s also great for sore muscles. You can also use a combination of oils to help you fall asleep. The below recipe is from The Essential Life, which has a ton of great recipes and shares a wealth of valuable information about essential oils. Add to bath and soak. You can do this yourself but why not get someone else to?! The oil you choose for your massage will depend on what you are looking for. Here are some essential oils that I recommend from the Young Living Premium Starter Kit (more details at the bottom of this post). Have a headache? Combine 7 drops peppermint, 5 drops lavender and 5 drops frankincense. Add to a roller ball (these are the ones I use) and fill the rest up with a carrier oil of your choice. I use sweet almond oil. Roll on neck, shoulders, forehead and temples and massage in. 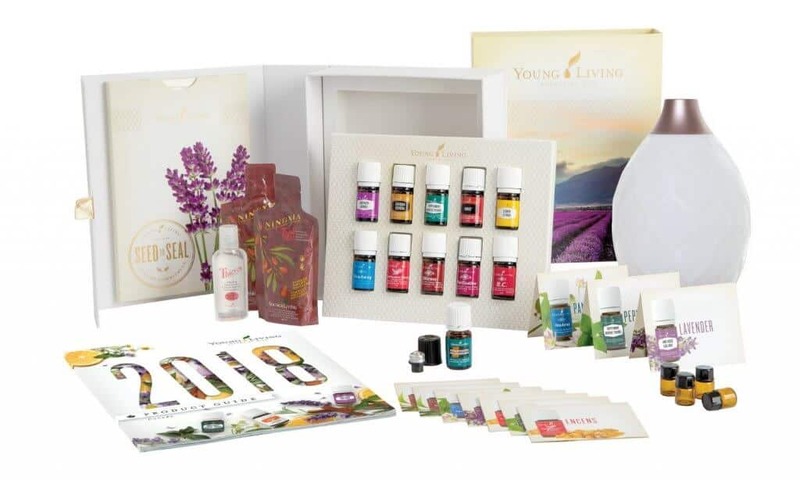 The most cost-effective way to get started with Young Living is to go with a Premium Starter Kit. Your starter kit includes a beautiful diffuser and oils you can use in your daily life to create a clean living, non-toxic home. Introducing essential oils into your daily routine is a lifestyle change and a change for the better. I personally love Young Living products as they stand for what I believe in – quality, authenticity and community. Want to order a Premium Start Kit online? To order a premium starter kit select the Wholesale Member option. Also, check that the dropdown on the left says your correct country. Simply select your country from the drop-down menu. Select the premium starter kit you’d like to order. I recommend the kit with the Dewdrop diffuser. I absolutely love to diffuse oils – but honestly cannot believe I have never thought to blend them before! Nice! Oh yes – blending is fun, especially if you like to put together recipes which I know you do. Try different oils together and see what you like best. It’s fun to experiment! Hey Anisa! Yes, they are really amazing and it’s nice to use them for cleaning too so you can get rid of toxic cleaning products in the home. I never knew you could infuse oil with tea! So cool, I will have to try that out! I love tea, too! I drink several cups of hot tea every day. I’ve been putting vanilla syrup in my tea, but now I know that flavored oils is another option! Thank you! I’m learning to love essential oils more and more, this is a great resource to look back on, thanks for sharing! Me too Megan! There is so much to learn about them and there are so many uses. It’s truly enjoyable discovering how useful they are in our daily lives. That’s a great idea to infuse tea with oils! Love it! I really want to get a diffuser for our bedroom and office as well. I typically use wax warmers, but having a diffuser in these rooms for str as would be nice. Hi Kayla! They are really nice to have and I think you’ll actually enjoy more than wax warmers. They are really cozy to be around at night too as many diffusers light up! This was really insightful! I’ve been going back and forth about joining Young Living, not as a seller, just a user of the products. Some of my friends use it and swear by it and whenever I’m at their office I always feel better and think more clearly. Maybe I should just do it! You can always try a few oils and see what you think. I think a great way to get started is by diffusing oils. If you ever have any questions about what oils would work best for you I’m happy to chat! I’m lucky enough to have a mum with a degree in aromatherapy, so I’ve grown up surrounded by the benefits of essential oils. However, I never thought of making my own sugar scrub and using them in that way. I will definitely remember that and pass it on to my mother since I know she’d love that idea. You are lucky! Oh yes, the sugar scrub is such a treat and really easy to make as well. i would still like to try out essential oils, so this was really helpful! This is such an awesome resource on how to use essentials oils. I love to use some of these like lavender in my diffuser, and in my bath. I am however to buy essential oils from companies such as Young Living. I bet those are much more high quality than what I am using. So I may try that eventually with some of the ideas you have listed here. Thank you for writing this. I’ve been getting into essential oils lately, and am really enjoying them for mood boosting, beauty and home cleaning. I feel so much better letting go of a bunch of toxic chemicals/perfumes I used to have in my environment. I’ve been using essential oils in my household for about a year now. I love it.